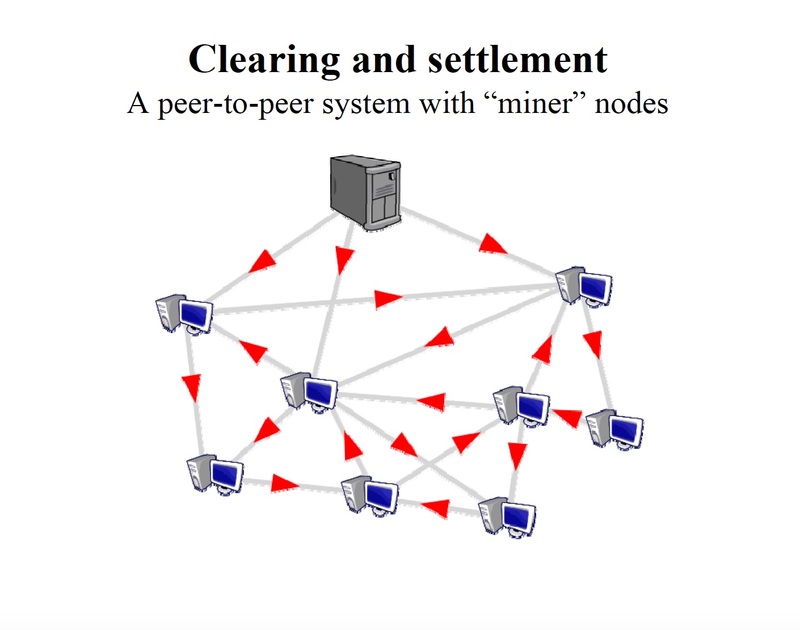 In January, NYU professor David Yermack taught a mini-course of three stand-alone lectures at the Stigler Center on the potential implications of blockchain technology. 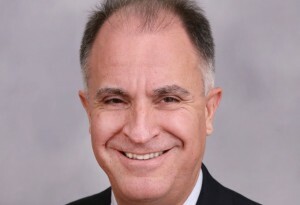 Yermack, the Albert Fingerhut Professor of Finance and Business Transformation at New York University Stern School of Business, has researched blockchain technology extensively in recent years. His Stigler lectures touched on the potential implications of blockchains for the future of finance, as well as for managers, institutional investors, small shareholders, auditors, central banks, and other groups in the financial world. A contract was signed yesterday [January 9], and there was a big announcement. 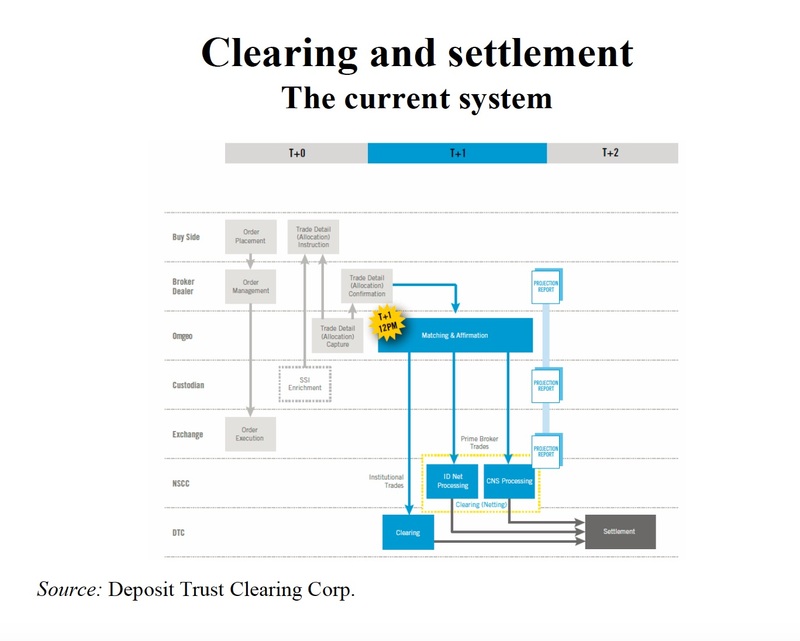 The company involved is the DTCC, the Depository Trust & Clearing Corporation, which does a lot of the back-office clearing and settlement, not only for equity trades but for many of the financial markets in the U.S. It says [that] following a series of tests, the DTCC has picked a start-up company called Axoni to use a blockchain, which is the networking system for digital currencies, to start tracking credit derivative payouts between big banks. Who is Axoni? The investors behind it are Wells Fargo, Goldman Sachs, J.P. Morgan, and other banks. This is a front organization for the established players. The IT company that’s going to run this thing is IBM. “A lot of people are talking about how they’re going to make us disappear,” says the CEO of the DTCC, “but here we are, one of the first users of the technology.” 1)Source: Telis Demos, “Wall Street Backs Blockchain for Savings on Derivatives,” Wall Street Journal 2017. It talks about the business that they have: about a million credit default swaps with a face value of $11 trillion. What they do is track who owes money to who and when they actually make payments. This is the kind of thing that you never give much thought to, but it involves many, many people doing a pretty boring job on Wall Street. Their internal estimate is that using the blockchain could cut the cost of this by close to half. So there’s a 50 percent cost reduction. This is the kind of first order thing that really changes the face of markets. Make no mistake about it: far fewer people are going to be employed. Those that are will be doing a job that’s really quite different. The banking industry’s hope is that these are just the tip of the iceberg in terms of the savings, that there’s been more than $1 billion invested in blockchain projects since last year. This is a paper by Thomas Philippon, also a professor in our department at NYU Stern. 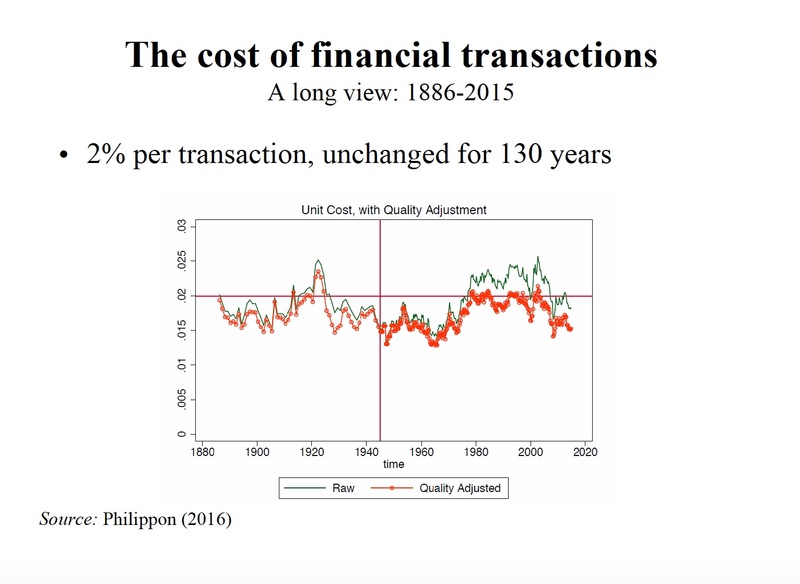 He’s put together a time series going back about 130 years into the 1880s, looking, in a very broad sense, at the cost of financial intermediation. If you borrow money from a bank or issue equity to the market, there is almost always a middleman taking a cut. What he’s measured here, over an extremely long time series, is that to raise money in the 1880s cost about two percent. To raise money in the 2010s also cost about two percent. In other words, there’s been no improvement in productivity in 130 years, despite the arrival of things like the telephone, the computer, all kinds of technology that arguably could’ve been used to improve this. My colleague Thomas talks about this as the FinTech opportunity—that there really is a desperate need for technology to come, reduce the cost of financial intermediation, probably by orders of magnitude, and leave that money in the pockets of savers and investors, basically reducing the cost of capital both for households but also for businesses. The hope of the entrepreneurs in this area is that technology will basically accomplish exactly this, by making it much easier to raise money. One other way to think about the context of this: if you look at Bitcoin by itself, multiply all the bitcoins circulating today by the market value of one coin, Bitcoin has a market cap of about $14 billion. That’s the face value of all the bitcoins circulating right now. How can you justify this with reference to some economic benchmark? Bitcoin has no cash flows associated with it, and unlike things like gold or other forms of money, it’s not obvious that it has other uses. You can look at the payments industry and the market cap of companies like Visa and American Express, who are basically payments processors; you can look at people who make ATM machines, like NCR; the software companies; companies that do money transfers, like Western Union, etc. This industry has a worldwide market cap on the order of about half a trillion dollars, as of 2014. Bitcoin right now is three percent of that. In the future, it’s not obvious that Bitcoin will be the channel for money transmission, but maybe it will. If you think about this as a disruptive technology, these are really the people who are vulnerable to disruption, more than anybody else. It suggests that there’s a lot of upside to this new technology. That if it’s successful, it may take over an economic space that people value worldwide as being worth on the order of half a trillion dollars. We’ll wait and see, but I think this is a very useful benchmark. First, I want to look at the idea of a company going public and issuing equity on a blockchain and what this might change from the point of view of shareholders, of the company itself, people like shareholder activists, managers of these companies, and so forth. I think there’s quite a bit that would be different. I’m going to show you five or six slides. These are based on an academic paper that I’ve recently written on the topic. A lot of this is purely speculative, but in 10 or 20 years, the equity markets might behave very differently. It’s interesting to imagine how this might affect the balance of power between shareholders, managers, analysts, and other people who populate the markets. I want to move past that and talk about some other topics as well. [In] accounting, which I mentioned a little bit [in the pervious lecture], there’s an idea for making accounting something done on the blockchain on an open ledger basis, where everybody could see each other’s transactions. It’s a radical idea, but it’s one that would completely change how people do auditing and the temptations to cheat and forge books. We’ll see if this is a utopian idea or a realistic one, but it’s one of the more interesting things I’ve seen in accounting research for quite some time. We’ll talk about smart contracts, which are a different kind of derivative security. These are contingent securities that execute themselves according to computer code. While they have great potential, enormous problems can happen and already have happened in this area. Time permitting, [I’ll talk] a little bit about the governance of blockchains themselves. Bitcoin is a very decentralized open blockchain. It’s an organic democracy, where people can propose things and see who likes them. Other blockchains are controlled by gatekeepers, or cartels, or coalitions. Just as we think about the organization of the stock exchange, and how stock exchanges are governed, and who has the right to unwind trades or arbitrary disputes, many of the same questions need to be asked about blockchains. If markets are going to migrate onto these platforms, the way we organize them and who has the decision rights, I think it’s going to be a major regulatory issue going forward. How would you go public on a blockchain, as opposed to the traditional stock markets? There are basically two ways you can think about this. One is that many of the stock exchanges themselves may migrate in this direction. I talked about the Australian case as being probably the first, but others may be following close on their heels. By default, it may be that most companies end up going public in the next 5 or 10 years in a very different way. This would be interesting. It would apply across the board, to all firms in the market. The other thing you could do is to start your own blockchain. To date, one firm, Overstock.com, has done this, back in November, but there’s certainly the potential that other entrepreneurial start-ups—I have suggested many times that firms like Uber and Airbnb may be thinking about doing this. You would really bypass the existing market infrastructure and issue shares on a peer to peer basis directly to the market. And I said that what you see here is the raw data that goes into one Bitcoin transaction, which is the address from which it’s being sent, the address it’s going to, how many bitcoins are being sent, and so forth. In the memo field of a Bitcoin transaction, you can also put additional information. That video of the baby that was born in Argentina was actually uploaded into this field. It was digitized and then put in a series of zero and one bytes and so forth. You could also put 100 shares of General Electric stock, with the following QCIP, or serial numbers, or something like that. Or you could put the title to your automobile with the VIN number, or any asset at all that you wanted to convey from the buyer to the seller and create an indelible record. What the bitcoin would do is essentially be a token. 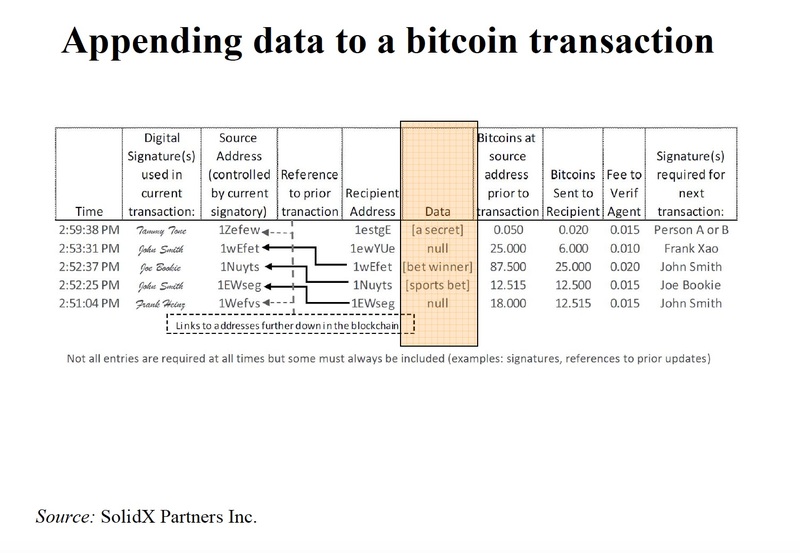 The idea is that you wouldn’t send 12 bitcoins but maybe .00001, some trivial fraction of a bitcoin, from person A to B. It’s really not the Bitcoin transfer but the information in the memo field that is significant. This is called “colored coins” because you’re taking bitcoins and making them red, or green, or pink, based on whether they are IPOs of a company or Marriott points that you want to give to some other account holder, or God knows what else. Anything else that has value and is tracked on a database, if you want to transfer it indisputably and securely you might be able to piggyback it onto a Bitcoin transaction and have more confidence in the reliability of the data than the way you would transfer it under the system that you have now. If you follow this idea through to its logical conclusion, you end up with one big blockchain in the sky, a major data artery, which is the Bitcoin blockchain that is really not so much a digital currency but an artery through which all financial assets are flowing, with Bitcoin being the mule, or the token. I think that there are many attractive aspects of this model. The two big ones are that first of all, this thing has proven itself. For eight years now, it’s been extremely robust, and unlike a new platform that you might start, there’s a lot of faith in the robustness and technical integrity of this. The second point is that you get standardization. If there’s one way to transfer all assets, it greatly reduces the cost of transactions, communications, and so forth. These are both extremely powerful arguments that you might want to move in this direction. The problem, however, is that the network as currently configured doesn’t have the capacity for this. Bitcoin has some constraints, and probably the most obvious is that you can put only about 2,000 transactions into a block, and there’s only one block per 10 minutes, which is 7 transactions per second. That’s not even enough to accommodate the people in this room and your economic activity, let alone the whole world. You would greatly need to scale up the network. Whether this is even possible, and if it were, how you would go about doing this, is a matter of great dispute. I will hopefully circle back to this topic by the end and talk about something called the Bitcoin block size debate, but even today, Bitcoin is pretty much at capacity. You need to have bigger blocks with greater frequency. But to get consensus on how to do this and to compensate the people who would lose from this, who are the miners who are making money off the current configuration, this has proved to be a really tricky problem. We’re now in almost the second year of a deadlock where people can’t agree on how to fix this. I find this colored coins model very, very attractive, but I think to get from here to there is not going to be the easiest thing in the world. What you’re really trying to do with all of these approaches is simplify what is an incredibly arcane system for trading shares of stock. This is just a regular trade. Go to the exchange today and buy 100 shares of Microsoft or whatever, and this is the number of days it will take to settle the trade—it actually takes three days—and the number of steps it goes through, which I believe is seven. And there are all kinds of novations and offsets and dispute resolutions—people have to post collateral. This is an incredibly cumbersome system, and I don’t think anyone designed this on a pad. I think this is something that evolved over time, that as things went wrong, they decided to make it even more complicated. I read an article in the Wall Street Journal that said if you look back to the 1890s, every day at 3:30, young messenger boys pushed wheelbarrows with slips of paper through the streets of Wall Street at a breakneck pace to get them by four o’clock. It said that system was cheaper, more accurate, and more effective than the system we have today. What’s going on here is compensating for two things: There is fraud in the system, and a lot of this is designed to screen out dishonest people who try to subvert the markets. There are also honest mistakes, things that, for instance, are called fat finger trades, where somebody puts an extra zero on a trade, or an extra three zeroes, and instead of buying a million they buy a billion worth. Then this crashes the market and things close down. One of the fun things about Bitcoin is that there’s no way to reverse a trade. If someone makes a mistake, it’s a mistake, and you have to live with the consequences of your own actions. You might approach the other person and apologize, “I’m sorry I sent you the billion dollars. Could you please send it back to me?” but you require the mutual consent of the two parties and you’re only going to get your counterparty to cooperate if they want to do it for reputational reasons or out of the goodness of their heart. Is it better to have all these layers of protection or to have a system where we all have to eat our own cooking? It’s a very interesting question. I think in the future, rather than saying one is going to be the standard, you’re going to have both in parallel and people sorting themselves into clienteles based on their own view of their own personal responsibility. But the cost of this [current] system is that we’re all paying spreads in commissions and fees that in the large majority of trades are needless. If we did move to this new world where everything was done on a peer-to-peer blockchain, I think the number one change that would really cascade across several aspects of corporate finance would be much greater transparency of ownership. What’s true about the blockchain is that you can look at it and see at any point in time who owns which assets. Every time a trade occurs, you can see who sold how many to who. This is something you cannot do today in the stock market even if you wish to. It’s information that, if it were available, would be extremely valuable not only to shareholders but to managers, to regulators, and so forth. We have instead a system of filing deadlines. For instance, institutional investors report quarterly how many shares they own. When managers trade, they have to report, but they have a 48-hour delay. Other people are able to hide behind intermediaries. But with a blockchain, you’d have a degree of transparency that I think would greatly change the balance of power and the flow of information into the market. It would have very serious impacts on things like liquidity, the accuracy of stock prices, the signals given to people about where they should be investing. A lot of this is extremely complicated. To really get into the details would take many additional lectures to parse some of the [hypotheses] and the theories. But I think there’s no question that would be different. A few qualifications are important from the very start: that first of all, you don’t see people’s identities directly; you see their digital wallet addresses. You’ll need a way to connect digital wallets to people. I think, in the end, this is not terribly difficult to do. You would expect companies to go into this business of being identity sleuths or providers. In fact, these people already exist in the market today, where they essentially consult for people and try to figure out who owns which assets and who’s selling them to who. A second point is that it really matters whether you’re talking about an open blockchain or one of these gatekeeper-permissioned blockchains. In an open blockchain like Bitcoin, everybody really could see everybody else’s wallet. There’d be literally no privacy. In a permission blockchain, in principle, you could probably restrict who could see what information. In fact, if you talk to the people at R3 and at the other consortiums, the main preoccupation of the people involved is that they are interested in this technology but only to the extent that they need to be able to be sure that not all the other people can see their client’s trades and so forth. Why are people so obsessed with privacy? I think there’s a number of good reasons. Some of this information is just valuable for competitive reasons. Some people just want to be unknown to the market. In countries [in] Western Europe, there [are] many aggressive laws about things like the right to be forgotten and the right to get your picture taken down from Google and things like this. It’s easy to see that the blockchain wouldn’t necessarily be in compliance with these laws, so there’s a lot of regulatory concern. But I think there’s also just plain old risk aversion, that people are afraid to make data available in a way that hasn’t been done before. For that reason, many of the banks are extremely cautious about how widely and when they’re going to implement this technology. I think it’s going to take some wildcat disruptors who have a different view of some of these issues to lead the way. For many of them the question is going to be: is the savings and cost, reducing my cost of equity, worth surrendering the privacy of my shareholder register? We’ll see many people wrestle with this in the years ahead. Who’s going to be helped and who’s going to be hurt by this? I think an easy group to think about are the shareholder activists who buy positions in companies and then try to agitate for change, to either throw out the managers or get higher dividends or more leverage of whatever. William Ackman runs Pershing Square Capital in New York and is probably the leading shareholder activist, but this is a large community. People like Carl Icahn and [others] have been doing this for many years. As a group, these people, in my opinion, are a force for good. Most of them stand for strategies that will raise the share price, hold managers more accountable. They select as their targets the worst companies with the laziest managers. We don’t necessarily want to hurt these people or discourage them, but they would lose the ability to hide and surprise managers. Under current law, if you are a shareholder activist, you can buy up to five percent of the company secretly. Even then, there’s a further 10-day grace period before you have to publicly file. In those 10 days, you are going to furiously buy every share you can. They would be able to see Ackman coming from a mile away, basically from the first trade. This would give management not only more time but also the ability to outmaneuver them and the court of public opinion, to recruit adversaries, their own colleagues. It would change the game of shareholder activism and probably not for the better. This would be a very indirect cost but, in the long run, probably a very, very important one: that in a blockchain market, activists might play much less of a role. If I’m a company thinking of going public on a blockchain, maybe this is actually attractive to me, that I could go public on the New York Stock Exchange and have to live with these people knocking at my door if I do a bad job, or if I could go public on a blockchain and know Ackman is just going to avoid me because he can’t operate in secret. This may, ironically enough, become a type of a takeover defense to make your shareholder registry as transparent as possible to discourage people, knowing that they won’t be able to take you by surprise. What about the managers? We talk a lot about pay for performance, and that the CEOs should have skin in the game, and that we want to motivate managers to think like shareholders. The way we go about this is by paying them in shares and options. We permit managers a certain degree of legal insider trading. Insider trading, at least under certain conditions, is very much against the law. But a lot of the time, it’s viewed very benignly. There’s every expectation that when we pay managers in shares and options, eventually they’ll liquidate them and realize some of the fruits of their labor. The ability of managers to make money off of this system would be greatly reduced. You would see again from the first trade that every time a manager sold something, this is more or less like requiring them to pre-announce their trades. It would take a lot of the percentage out of the game for managers. Retroactively, this one CEO was able to give himself options when the stock was down in the tank. It looks like it motivated him to do wonderful things, but he was just looking back over his shoulder and stealing money, not to put too fine a point on it. All of these things would become pretty much impossible. You would not be able to manipulate the system and use tricks that are hiding behind the weakness of the disclosure rules. Again, this would take a lot of the percentage out of the job for the CEO. Managers often unwind their position secretly by entering into equity swaps and other derivative transactions with Wall Street firms who are willing to swap them the rate on treasuries for the rate on your stock. This is something that should be disclosed but compliance is very low. You’d be able to see all these. You’d even be able to see situations like when the CEO of Coca Cola decided, “Things are gonna go bad. I’d better buy Pepsi to hedge my human capital.” We don’t know anything about managers investing in each other’s stocks because there’s no required disclosure, but all of this would become transparent. I think for managers, basically they would hate this. Shareholders would view a lot of these reforms as long overdue. But you would lose something very important here, which is the ability to use equity compensation to give these people deltas that motivate them to raise the share price. Incentive compensation would become a less effective tool. I think what you’d have to do is raise the pay of the managers to compensate them for what they’ve lost. This would be a very ironic outcome. What do we get from the blockchain? 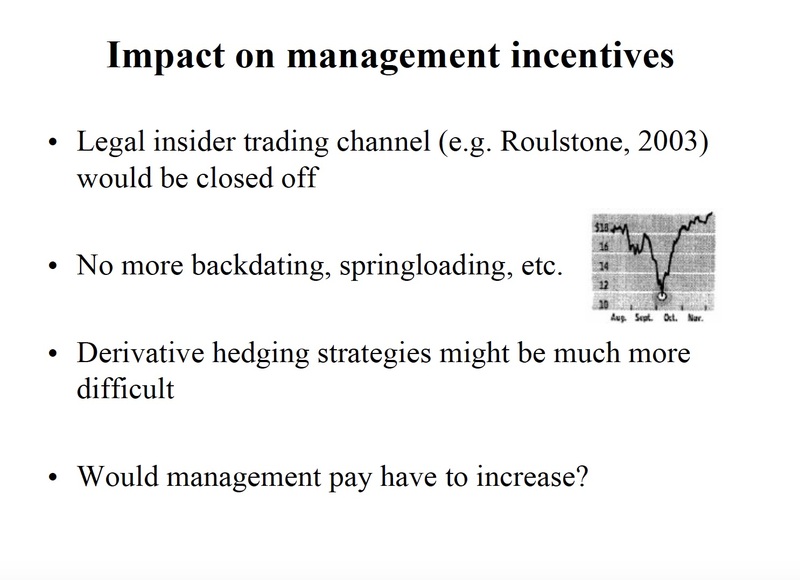 Less shareholder activism, higher executive compensation that nevertheless is less effective. This is not obviously stuff that we want. 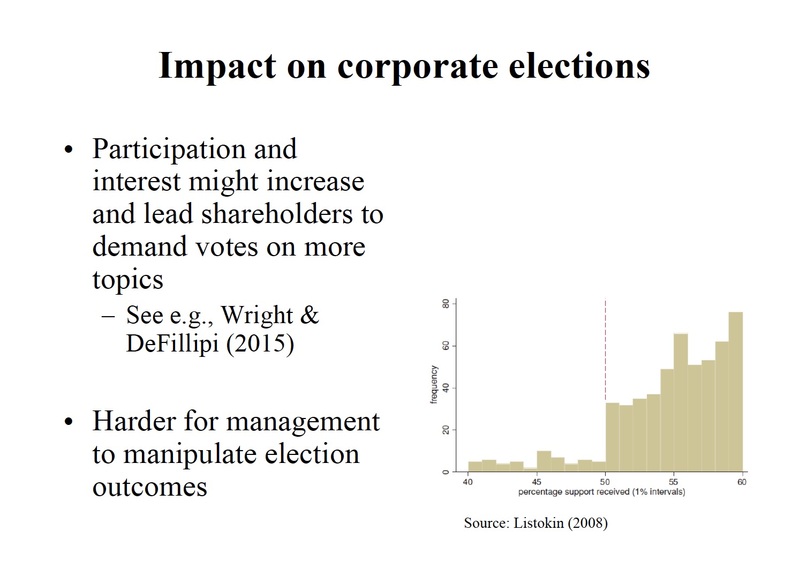 A third area is shareholder voting. U.S. corporate elections are rigged. There’s no other way to describe it. The system is rigged. It’s unbelievable how bad it is. I’m not just making this up. There’s some very good academic studies like this. If you’ll look at the distributions of votes scheduled by management, the number they get, 47, 48, 49, 50—there’s no reason in the world that that shouldn’t be a continuous series, but management has enough tricks to push these things over the goal line and barely win far more elections than they barely lose. This is a real problem in corporate governance. Without going into any of the details, the fix would be a better voting system, which management has absolutely no incentive to want to bring into play and so forth. But blockchain elections had been touted by many people as a much more accurate way of doing this. The interest in this is not limited to the corporate world. There’s a lot of people that think blockchain voting should be done in political elections as well, especially in [countries] where the technology and monitoring of the ballot box is open to question. How would this work? You would give every eligible voter a token which they would then mail to the eligible candidates. In the presidential election, you would get a voting token. Then you could mail it to the blockchain address for either Hillary Clinton or Donald Trump, or whoever you wished. You would just be able to count the votes. This way, you would know the result immediately. You would not need recounts. Voter fraud could be screened out at the distribution of tokens, etc. This system seems both cheaper, more accurate, and very compelling. Again, I think the case is even stronger in political elections. There’s a lot of interest from this in third-party NGO groups around the world who are pushing blockchain voting as a potential reform against corrupt governments in all kinds of places. The good news is that this is happening very actively already. The Nasdaq owns the Estonian Stock Exchange. In 2016, they announced that all the voting in Estonian corporate elections will be done on a blockchain. This was like a bolt from the blue. You may not know this, but Estonia is the most digital country in the world. They have this national smart card that you can use for everything from your tax refund to enrolling your kids in school, going to the hospital, whatever. You can use this card for shareholder voting too. You can even get one of these as a foreigner: if you are a U.S. holder of Estonian shares, you can go to the consulate and they’ll give you one of these smart cards. Now, it’s not much of a stretch to see that Nasdaq would want to migrate the system to the real market that they own in New York. In the U.S., a lot of this is outsourced. There’s a private company called Broadridge that counts the votes in about 85 percent of all U.S. elections. 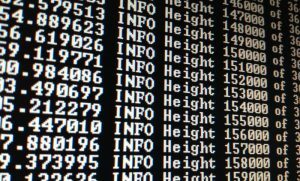 Broadridge has become a big blockchain evangelist. 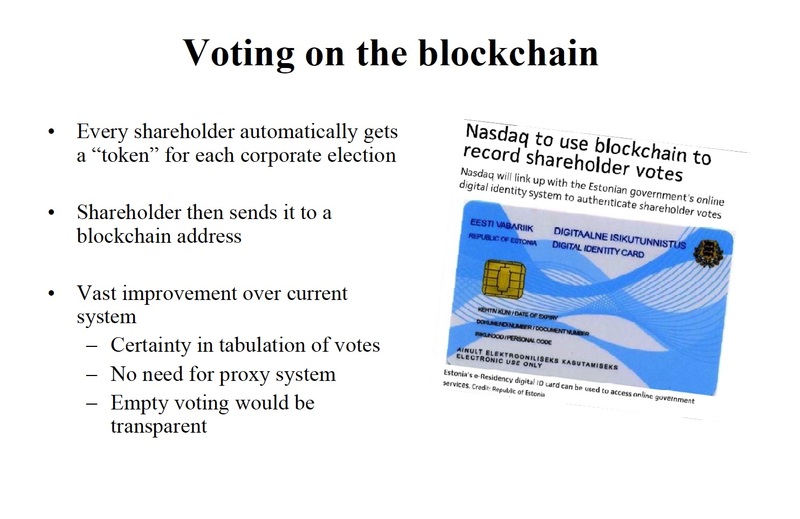 If you google Broadridge and blockchain, they are actively developing this for use in U.S. shareholder elections. I think within a year or two, you’re going to start to see large numbers of U.S. companies on the regular exchanges beginning to have shareholder voting on a blockchain. This will solve a lot of problems in corporate governance where management does manipulate these elections in a particularly unappealing way. It would provide just basic information about who are my shareholders, and interesting research questions about how votes are traded on days of elections. There are all kinds of areas of corporate finance that are grouped together under the heading of empty voting, where people hypothecate voting rights through derivative transactions, and whether this is good or bad, or even legal, it’s very controversial. You’d be able to observe it and get a much better fix on how much of this is happening, what the consequences are, and so forth. As somebody who’s a specialist on the governance area, I look forward to this. This is a great reform. It’s hard to object to it on any basis other than “I’m benefiting from crooked elections, and I want them to stay crooked.” For most shareholders, this is a quick and easy reform that I think is much closer than any of the others to actually happen. Let me move on now to accounting. I want to talk about a proposal, [which] you can read about in this Internet manifesto that was posted about two years ago. It’s summarized here by a man named Richard Gendal Brown. He is one of the early promoters of distributive ledger technology. He worked for many years at IBM in the U.K. and is now one of the chief people at R3, the big consortium of banks. He says you can imagine a possible future where books are kept in a completely different way by companies. That all firms would record their external obligations and claims on a single ledger that would be shared and massively replicated. The way accounting works today is that every company has its own ledger. They have auditors who decide about things like depreciation schedules, and how to expense things and when, and when to write off obsolete assets. This is very different [in that] every time you transact with somebody, you and a counterparty would mutually agree on the form of the transaction, enter it into the ledger, and everybody would then be able to draw down the raw data and make their own financial statements. I call this real-time accounting because, among other things, it’s not beholden to a system of quarterly earnings or fixed reporting periods. You would just continuously record your transactions on the ledger. Anybody who wants to lend you money, or evaluate your credit, research analyst, vendors, whoever, they can just pull down the raw data and do your balance sheet today or eight weeks ago, or anytime that they wish to. If I want to know your earnings, I could look not at the last quarter but at any period that I thought was relevant. If I don’t agree with your view of the depreciation schedule, I can make my own depreciation schedule and correct the biases that you’re probably imposing on the data. The goal here is to screen out the enormous number of moral hazard problems that we have in accounting. It’s well known, and I think you guys have learned in all the accounting courses you’ve taken here, that firms behave opportunistically, that companies characterize their transactions in a way that benefits them and makes their statements look as positive to the market as possible, within the limits of the existing rules. Often those rules have an awful lot of wiggle room that people take advantage of. There’s all kinds of crazy turn-of-the-quarter effects, that a lot of financial asset management companies own shares on the last day of the quarter and then sell them on the first day of the next quarter. Banks are in compliance with their capital regulations probably four days a year, which are March 31st, June 30th, and so forth. Then, because the other days don’t lead to audits and measurement periods, they do whatever they want. All of these kinds of problems would be defeated by a system like this. It has many, many interesting advantages to it. One of which: it’s much cheaper because you don’t have to hire auditors of every company and third party auditors to check the books. The costs are also easy to spot. One is that you’d put a lot of private information in the public record; your competitors could see everything you were doing. But this is not new. In fact, if you go back to the 1930s, when the Securities Acts were introduced in the United States, there was huge protest by companies on the stock exchange that forcing them to file annual reports with their balance sheets would give away the store, and they could never be able to compete. We’re well past that, of course. There’s a school of thought, which in fact is often attributed to this university, that companies should all be able to publish whatever information they want. That if you want to put out quarterly reports because you think it’s in your interest, you should do it. That’s not the idea that I’m pushing here. I’m saying that perhaps everybody should have to publish everything. The raw data would be such that few people could make sense of this on their own. What would be likely to happen is that specialists would emerge to download [the] package, interpret the data—in fact, they might even be the Big Four accounting firms who would diversify into this line of business. I think this is much more of a utopian idea, but it’s also a very provocative one. It’s one that forces you to reconsider exactly why we have audits, why we have companies provide financial information to the market in the form of quarterly earnings, and balance sheets, and so forth. This open real-time accounting is a radically different idea, one that’s not going to happen tomorrow but would completely remake the field of financial reporting in a way that it’s perhaps much better than the system that we have now. Let’s talk briefly about smart contracts. Some of you may have a background in the law; if you’ve ever actually taken a contracts course in law school, I’d recommend that you download this article by a Hungarian mathematician named Nick Szabo, who 20 years ago proposed this idea. This is the cleverest thing I have ever seen in contract law. Szabo makes a simple observation that, as written here, many of the things that get negotiated in contracts like the conveyance of collateral upon default are things that you can replicate in very basic computer code. One of the examples that Szabo uses is the auto loan. If I buy a car, I agree to 48 monthly payments. If I miss a payment, they have the right to take me to court and get the car back. But this is expensive. You have to hire a lawyer. You have to deal with cases of forbearance. Typically, people will let you miss two or three payments and then they’ll have to hire a repo man to steal the car out of your driveway. With a smart contract, as soon as you miss the first payment, you could shut off the car if it has one of these electronic keys. This would remove the temptation to engage in what is called strategic default, where you decide not to pay because you know you can get away with it. This is the kind of thing that can make you president, but it’s also the thing that raises the cost of capital for everybody else. If you buy a car today, you pay four or five percent perhaps, but that could be two or three percent if you had a technology like this in the background. This would benefit everybody but the strategic defaulters. People would take out of the equation, of course, the lawyers, because you wouldn’t hire a lawyer. We got rid of the accountants in the last slide, and this is getting rid of all the lawyers by just automating contract law. Szabo is a very, very clever guy and he says the original smart contract is the Coke machine. That if you put in your two dollars, with a high degree of certainty, it performs, it gives you the Coke. It doesn’t consider strategic default. It has no capacity. You can rely on a technology that’s been replicated and proven [to] live up to the other side of the deal, and this makes you more willing to put in your money in the first place. How would we see this in corporate finance? Secured debt, which many, many companies issue, is one of the most straightforward applications of a smart contract. Basically, secured debt means that you’re posting collateral and the ownership of that would change contingently if you didn’t perform or default. You could just have a smart contract that if somebody either didn’t make their payments, or maybe fell out of compliance with the financial ratios that you agreed to as a minimum set of liquidity conditions or whatever, that would essentially convey directly from the debtor to the creditor, without any need for a foreclosure procedure, a bankruptcy hearing, or anything like that. I think it’s easy to see that more complex contracts could be written, but what this would amount to is pre-contracting the resolution of financial distress. This is a major topic in corporate finance: What to do when people don’t pay? It’s understood, if you guys have done cost of equity, that you always tack on to the end [something] like three percent for the cost of financial distress times the probability that you might get distress and so forth. A lot of the faculty here, in fact, have been heavily involved in researching this, trying to benchmark it and measure it. Here, you could head this stuff out of the system in advance with well-drawn smart contracts. Things like restrictive covenants, which are quick and dirty solutions to strategic behavior, these might become unnecessary. That we would have simpler debt contracts, cheaper to draw. The bottom line is, the last bullet point here, that the cost of debt should become cheaper. That companies could issue debt at a much lower cost, and in the end this is the kind of thing, of course, that benefits everybody, that allows entrepreneurs to raise money, jobs are created, etc. What you’re doing here is defeating the problems of adverse selection and moral hazard that are timeless concerns about people in the debt markets, and then the foundations of many of the academic models and theories we have about why companies issue certain kinds of debt, and what contingencies were placed on them. I think this is an extremely promising area: even if you set aside some other things about digital currency, the idea of a smart contract, where you use code to essentially mechanize and automate the promises of people and enforce them not by courts of law but by technology, seems [like] an idea that has legs. That we’ll migrate into many aspects of consumer finance. In fact, they probably already [have], if you think about this in many directions. Now, a lot can go wrong here, and a lot already has. You could make mistakes in the code, and even if you agree that there’s a mutual mistake, it’s not clear that there’s a basis for rewinding and going back. You can have poorly drafted code that leads to a debt spiral, the kind of recursive code that shouldn’t be recursive. If you’ve done any programming, you should understand what this means. Stuff that essentially lets the horse out of the barn in such a way that you can’t get the horse back and the damage is very hard to remedy. I want to talk about this in a moment in the context of Ethereum, in this organization called the DAO, which is the event that happened over the course of last summer and raised a lot of interesting questions. The other thing that you have to be concerned about is the role of the courts, not just for efficiency reasons but for reasons of equity and justice. We don’t foreclose on the homes of people who don’t pay their mortgage if they’re in the military, or if they have cancer, or if they’re over the age of 80, because courts just don’t let this happen for reasons of compassion and equity. Most plaintiffs know better than to even try to do this, but courts essentially imposed not only mechanical interpretations of the rule of law but also wisdom and ideas of fairness that are part of the culture. You lose a lot of that if you go to a world of smart contracts where everything is mechanized. I think it’s a step that as a society you have to think very carefully about. Do you really want to purge the courts of all notions of equity and fairness in favor of pure efficiency? If you want to retain those things, at what cost? What’s the cost in potential efficiency gains that you might give up? This is a problem that comes up in a lot of law school courses. Smart contracts focus you and give you even more data to think about this in a very rigorous way that maybe hasn’t been possible before. These things are here to stay, and these questions are going to be raised in many settings involving both business and personal life, and it’s going to be something to keep law professors busy, certainly, for many more years. Also, [these questions] highlight many ways in which [the] job of lawyers is likely to change as you confront these issues more and more in the field of technology and computer code. Now let’s talk about the DAO. I’m bringing this up because it’s going to be very famous for many years as an example of a smart contract run amok. What is the DAO? It stands for Decentralized Autonomous Organization. This is a corporation with no employees that is run entirely by computer code. There are futuristic thinkers that believe many businesses could be designed like this looking forward. If computers are so smart with artificial intelligence coming along, [then] why do we need CEOs and employees? Why not just code everything up and let these organizations run themselves? People thought that this was maybe 10, 20, 50 years down the road, but someone decided to start one of these things. This was part of the Ethereum project. Ethereum is a digital currency somewhat similar to Bitcoin, but with other capabilities. It’s run by a genius in Zug, Switzerland named Vitalik Buterin. I think he’s 23 years old and he’s the guru of this whole movement. The DAO was supposed to be a robo-venture capitalist. It was going to raise money and then select investments, all without any employees—just using a mechanical process—and then eventually pay out the profits to the investors. In fact, the hackers appear to have read this list and [said], “Oh, yeah, let’s take the money.” It’s still controversial whether the hackers were motivated by greed or trying to do a public service, by pointing out that people are moving a little too fast with this technology. There was balloting on a website called CoinDesk, which is a news provider for digital assets. The DAO hacker was voted person of the year in the crypto world—as the leading newsmaker, the person who succeeded in raising the most interesting issues, and so forth. This shows that clearly there are unintended consequences to even the most famous smart contracts. What was really interesting was how this thing got cleaned up in the aftermath. 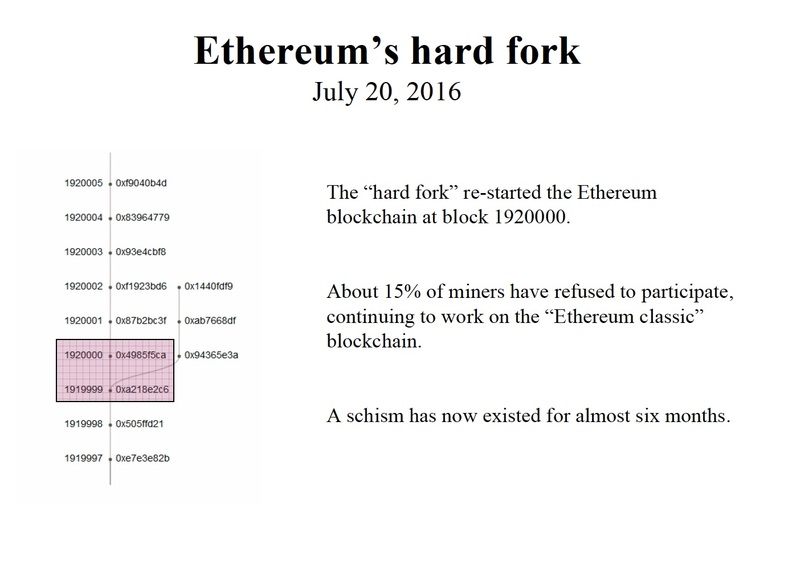 What happened was, the Ethereum people voted to rewind the blockchain to the night before the hack. This is something called a hard fork. A fork is where you upload a new version of the code and invite people to follow your fork, and if more than half followed the fork, that becomes the main trunk of the blockchain. As I mentioned in the previous lecture, you can do this with bitcoin. Any of you could write a new code tonight, and if you can get 51 percent of the miners to start using your software, it would be a hard sell, but nevertheless, in principle this could happen. Fifteen percent didn’t go along with this. I think a few of these people lost money from the hard fork. This is probably why they wouldn’t support it, but most of them really objected in principle to what had happened, because there are two things that really should never occur: One is that you’ve rewritten history. The other is that you have a smart contract where code is law. Whatever is written is supposed to be what’s enforced, and there’s supposed to be no possibility of human intervention, but in fact, humans intervene and stop the smart contract in the middle. You can look at this situation and say, “These people are a little too excited. Mistakes were made. Let’s do it over.” But you’ve set a precedent here that arguably is going to be referenced by anybody on a blockchain when things go bad. What the long-run significance of this [is] is going to be very interesting to see. I would’ve been in the 15 percent. I think that despite the fact that these people lost a third of the money, you’ve got to stick with the principles of the system and not set these precedents that in the end are going to undermine the whole technology. But the reality is that the technology is such that a democracy can overturn what’s good for a minority. Even on Bitcoin, I think everybody knows that the number of bitcoins is fixed. That in the end, there can’t be more than 21 million bitcoins, at least until they vote to change it. There’s a lot of talk about you have an algorithmic monetary policy, but it’s really only as good as the willingness of the majority to tolerate the rules. I think in the world we live in, it’s often relatively easy to persuade enough people to change the rules when it’s in their interest to do so. “The Blockchain Is Going to Revolutionize Central Banking and Monetary Policy” Where Will the Crypto Craze Lead? A Venture Capitalist’s View Does the Growth of Bitcoin Have Anything to Do with Distrust of Government? 1. ↑ Source: Telis Demos, “Wall Street Backs Blockchain for Savings on Derivatives,” Wall Street Journal 2017. « Does Empowering Shareholders Also Empower Special Interests?